Everyone knows who Archie Andrews is, right? And Betty, and Veronica, and Jughead, and Sabrina the Teenage Witch, and her aunts... but how many of us have read more than a single Archie comic in the last ten years? I mean, there's Afterlife with Archie and The Chilling Adventures of Sabrina, a pair of fantastic horror comics that use the characters in shockingly bleak ways. But for most of us, when we think of Archie, we think of the teen drama, the love triangle between Archie, Betty, and Veronica. They're some of the medium's most iconic characters, and many of us have never read their comics. Now is the time to change that. 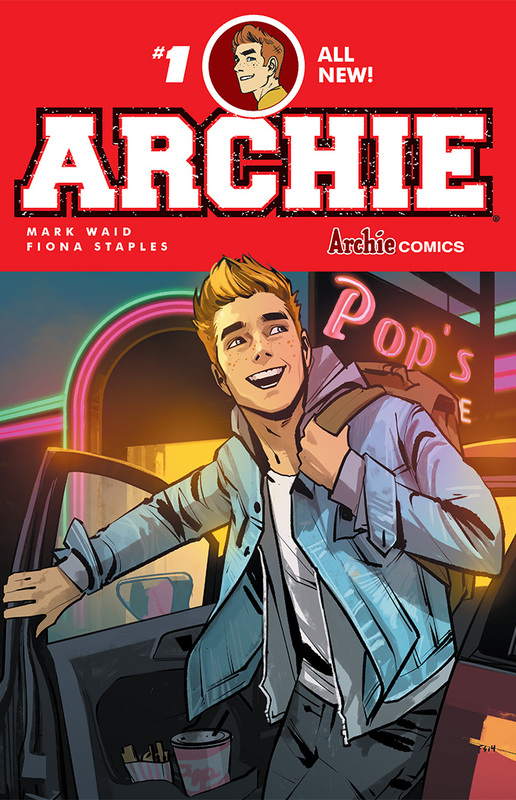 Writer Mark Waid (Kingdom Come, Daredevil) and artist Fiona Staples (Saga) have revamped Archie following his death in the pages of Life with Archie last year. The new Archie is back in high school, back to the very beginning, and surprisingly, sharp as hell. Archie Andrews is a reasonably well-liked teen at Riverdale High. He's friendly, kind, but he doesn't really stand out in the crowd very well. Or, he didn't. 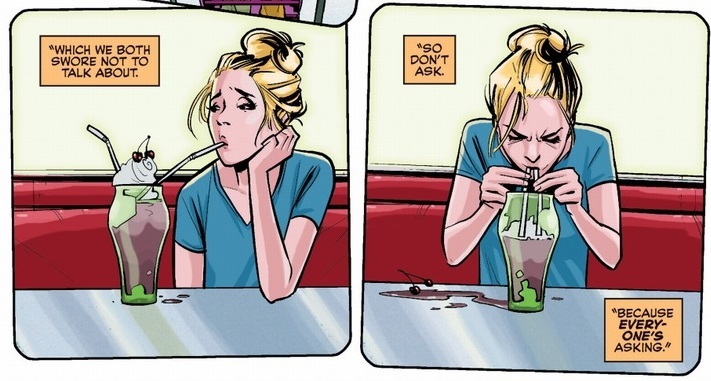 The one thing he was known for was his long-running relationship with girl-next-door Betty Cooper - a relationship that has suddenly come to an end, and no one knows why. Now, Archie and Betty find themselves under the spotlight at school like never before, trying to figure out how to navigate a world where your best friend has suddenly become someone you can't talk to anymore. Fiona Staples brings that slick sense of visual storytelling that helped make Saga the monster hit it is today. Staples gets a lot of credit for her inventive visuals on that Image sci-fi series, but what makes the series work - and what makes her irreplaceable on it - is actually her more subtle character work. I've talked before about my believe that empathy is the key to great storytelling, and Staples makes it easy to see these characters as real people with distinct physical personalities. Waid doesn't have to have Betty say a word for Staples to show us exactly how she's feeling, and you can tell the difference between how Jughead and Archie interact with the world just by watching them stand. Archie is clearly having a good time here - he's smiling, just saw a movie he apparently liked quite a bit. But he's also lonely in the midst of all these other couples, something anyone who goes the the theater alone will be familiar with, used to having company with whom he can discuss what they just saw. And, it's a great visual gag, following the row of couples down to establish the sequence's visual language and set up expectations before ending on what the popcorn thought of the movie. All without a single bit of dialogue, and in just one small panel on the page. Archie #1 is a near-perfect all-ages comic, one that captures the spirit of classic Archie while giving new readers plenty to hang on to. 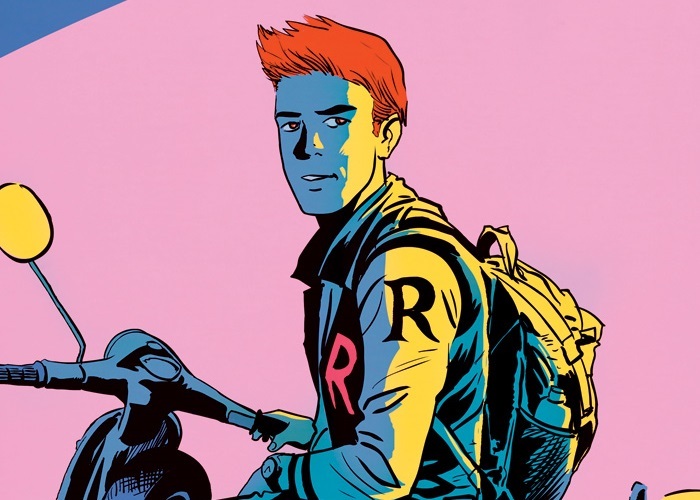 Archie - standard-issue, no-supernatural-action Archie - is always going to be a tough sell in comic shops, but Archie #1 is a powerful argument in favor of more mundanity on the shelves. This kind of story is a staple in teen film and has been for generations at this point, which may make some of the beats the book hits feel overly familiar, though I'd argue it's the rare teen flick that hits them so well. But, as we've seen recently with The Walking Dead, sometimes comics can turn a familiar story on its head just by virtue of continuing well past the point where a self-contained story would have to stop, can find nuance or depth in the finest of details. 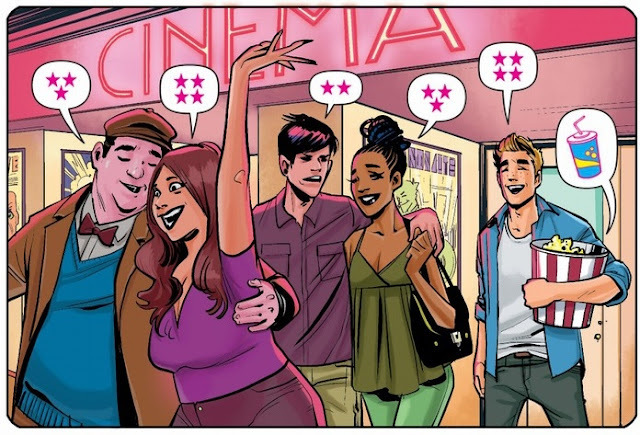 Archie #1 is a smart, welcoming comic that revels in those details, and a promise of great things to come. Archie #1 was written by Mark Waid, illustrated by Fiona Staples, colored by Andrew Szymanowicz with Jen Vaughn, and lettered by Jack Morelli. Published by Archie Comics, Archie #1 was released on July 8th, 2015.